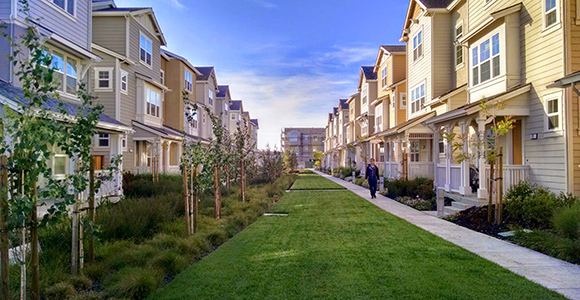 Five reasons why Silicon Valley needs more housing of all kinds, everywhere, now. On a day Bay Area home prices climbed to a new record (with the median home price in the nine-county region climbing to $800,000), a new report offers a glimpse of how these sky-high housing costs are impacting people's lives in the epicenter of the state’s affordability crisis: Silicon Valley. In the report, Silicon Valley’s Housing Crisis: How did we get here, and what can we do about it?, the Silicon Valley Community Foundation and the Center for the Continuing Study of the California Economy make the case that the price of housing is now affecting, well, pretty much everybody—and every part of the region’s economy. To understand just how much, researchers studied housing data in three counties—San Francisco, San Mateo, and Santa Clara—that together encompass most of the Silicon Valley job and housing market. Their analysis reveals five disturbing facts, which they hope will drive local and state leaders to do more to encourage communities to approve more housing all of types—while also finding ways to actually reduce the cost of housing development (something the CA Economic Summit has noted is still largely missing from today’s housing debate). What are high housing costs doing to Silicon Valley? Five inconvenient truths. 1. It’s burdening everyone, not just poor. “When people pay more than 30 percent of income toward housing costs, they are considered ‘housing cost burdened,’ and when they pay more than 50 percent, they are considered severely housing cost burdened,” says the new report. “In San Mateo and Santa Clara counties, nearly half of all renters are housing cost burdened, and nearly 40 percent in San Francisco are in that category. Median monthly rents in those areas are $2,783 and $3,888, respectively.” To afford rents even at that low end, households need to earn at least $92,000 a year. 4. The problem is a supply shortage: “Silicon Valley added 344,149 residents between 2007 and 2016. To keep pace with this population growth and maintain household size at the 2007 level, an estimated 130,094 units of new housing would have been needed in the region. However, only 69,503 units were issued building permits.” In other words, the region has built barely half as many houses as it needs to build. 5. Most of the houses getting built are high-priced homes for the wealthy. As the chart below shows, this is true in every part of Silicon Valley, with the exception of San Francisco, which has also found a way to build half as many units as it needs for very low-income residents—but almost no housing for low-income and middle-income workers. This market reality has two negative consequences: 1) It means fewer new houses are affordable for the majority of residents in Silicon Valley, forcing people to leave the region or commute from several hours away; 2) It makes it that much harder to get any new housing built, since community groups, for a variety of reasons, point to the luxury-only units going up as proof that expanding supply doesn’t make housing more affordable. This vicious cycle is at the heart of Silicon Valley’s housing crisis—and the study argues that only a combination of regulatory streamlining, expanded funding, higher density, and targeted production incentives can put a stop to it. To read more about the report’s findings—and its proposed policy solutions—click here.